I was up in the middle of the night thinking about plastic fruit cups yesterday…I’ve been trying to use up some of my overgrowing collection of them. So far we’ve made a Polar Bear Mask and last week in our Leprechaun Hat Treats. 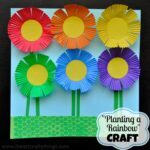 Since yesterday was the first day of Spring and we have had some pretty bulbs pop up in the front yard, we decided to get out our favorite Springtime book Planting a Rainbow by Lois Ehlert and some of our plastic fruit cups and we planted ourselves a very pretty rainbow flower garden craft. This spanned out to be a two day project for us. We painted everything one day and let it dry completely overnight. Then we finished assembling it the next day. It is now the centerpiece on our kitchen table and every time I walk by it, it is greeted with a cheery smile! I love Spring! 1. Start by painting the inside of your fruit cups all of the colors of the rainbow (No need to paint the outside). We threw in some pink and a couple different shades of blue as well. 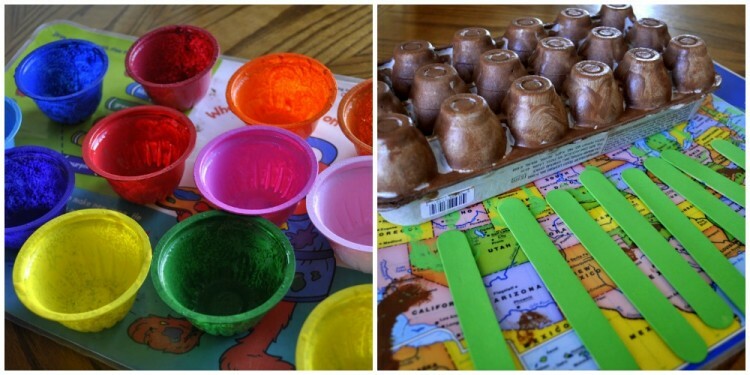 Also, paint your wooden craft sticks green and the bottom of your egg carton brown. We used acrylic paint. Let the paint dry completely. 2. Affix the bottom of the fruit cups to the wooden sticks. You can use tacky glue or school glue but since we are inpatient around this house, we used a hot glue gun. 3. While you have the hot glue gun out, glue a large pom-pom in the center of each cup. Try to use a variety of different colors instead of just yellow. I let my kids choose the colors and place them inside the cups once I had put some hot glue in them. 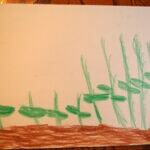 Then my kids cut some stems out of green paper and glued them onto the stems with school glue. 4. In order to poke the flowers into the egg carton, an adult will have to use a craft knife to cut a small slit in the middle of each egg carton section. You won’t be able to place a flower in each section because they will be too crowded, so scatter them out over the egg carton. 5. 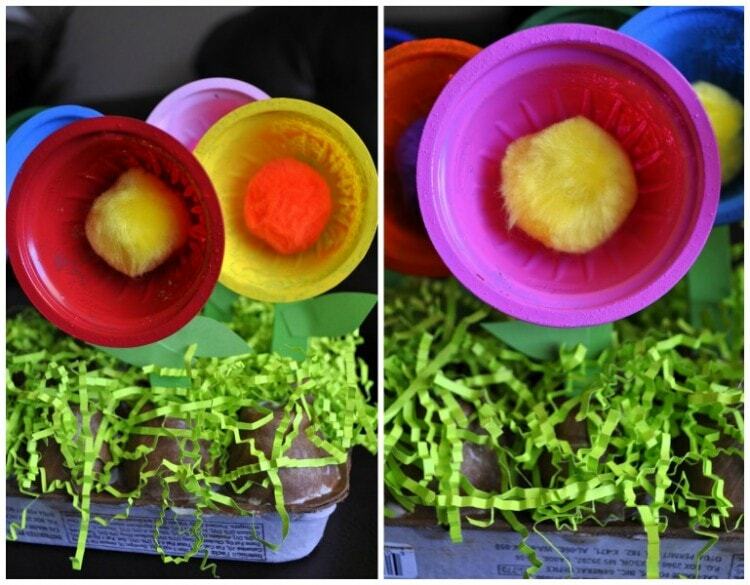 Now you can poke all of the flowers into the egg carton. Last, we diluted some school glue with a little bit of water and used a paint brush to paint it all over the egg carton. Then spread the green Easter Grass all over the egg carton. These are too cute!! I have been looking for a way to use my fruit cups. Great idea! So creative!! I love your fruit cup creation!! What a clever craft. So much fun! I really love this project! I have a lot of those cups too. My husband has the same issue with my upcycling. This is ADORABLE! On April 2nd, TinkerLab is having a Linky Challenge using egg cartons and I have been racking (sp?) my brain trying to come up with something different and unique. Hopefully in the next few days I come up with SOMETHING! Erg! But I hope you link up on her site though. It will be fun! 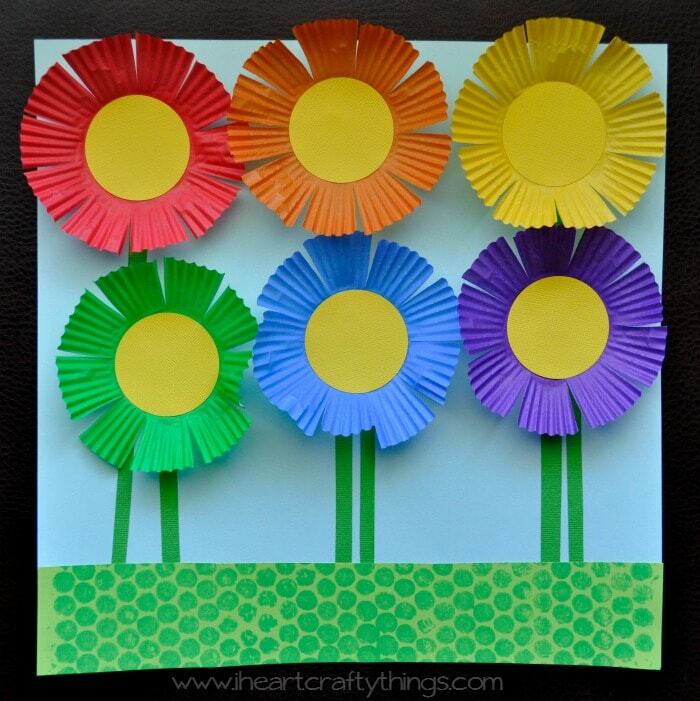 I love that this craft is done mostly with recycled materials! Good job! 🙂 Will have to do it with my son! Clever idea! Looking forward to trying it. And getting the book from the library, too! Beautiful craft, as always. Thanks for sharing at Fabulous Friday. 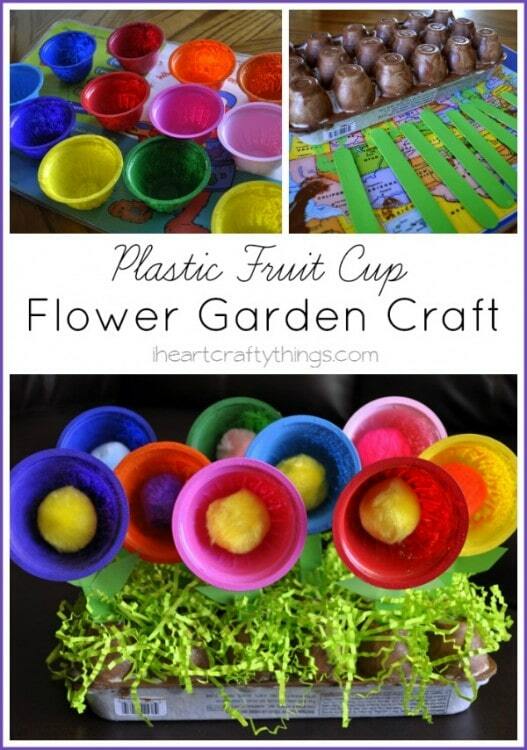 What a fabulous way to reuse fruit cups! 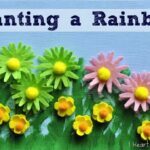 Thank you for linking it to the Rainbow Connection! So cute!! I love it! Thank you for sharing at Sharing Saturday! I hope you will share again this week with us! Wow, this is so cute – love it! I would smile every time I walked past it too. Thanks for sharing with Hey Mom, Look What I Did on Adventures In Mommy Land…hope to see you again soon! Too cute! It never occurred to me to try crafting with fruit cups! I'll have to try it. My kids will love this! Thanks for sharing! I love this idea! I would like to try it our in my class. I did do a test flower but the paint didn't stick!! What kind of paint did you use? My next attempt will be to add glue to the paint. Thanks for posting this great idea. @Janet S Janet, we used two coats of acrylic paint on the fruit cups. Ours seemed to stay intact pretty well. 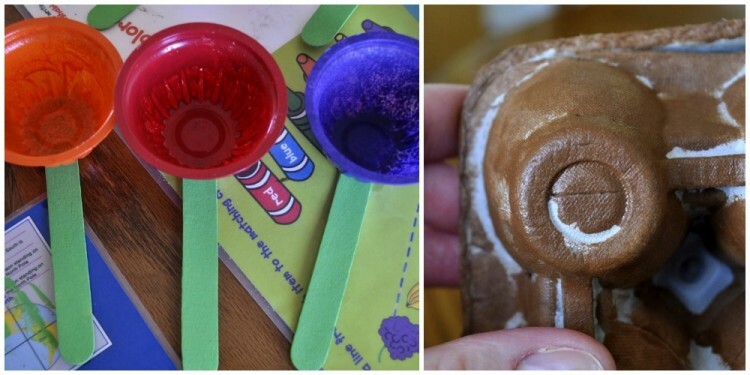 We used this same technique for our polar bear mask and I did notice some paint chipped off after the kids played with them endlessly for an entire day, but the majority of it stayed on the cup.Hope this is helpful and I hope your class enjoys this craft! Thanks for the lovely comments! I just spotted this and thought – that could be done with bottle tops too (hehe). Love the fruit cups – we don't have those over here, I don't think. 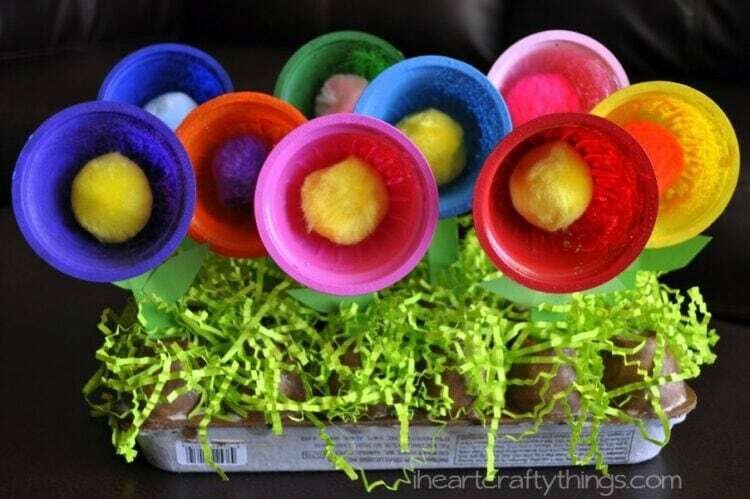 i think we will try doing this with plastic eggs left over from Easter for my 3 year old grandson.